Project management software is a must for any process-driven company and two of the most popular tools in this space are Asana and Basecamp: they help your team get organized with task groups, progress tracking, and facilitate collaboration. While both Asana & Basecamp offer an exceptional user-experience, they have not been built with an holistic approach to help small businesses. TeamWave is a complete platform to manage & streamline everything (including projects) in your company: Project Management, CRM & HR. Moreover, TeamWave is at par with other popular tools in terms of usability and features. All the apps provide similar features – task management, reporting, document management and messaging. However, there is big difference in implementation and especially user interface of Asana when compared with TeamWave and Basecamp. Working with third party users is one of the crucial aspects of project management. In case of Basecamp and Asana, you can add client users by inviting client to your projects (requires multiple steps) which means you are required to mange the users as well. For example, in case your client’s employee leaves their organization, you’d have to delete the user. TeamWave has a specialised workflow for vendor/client collaboration. Just invite just one person from your client’s team and they will be able to independently add/manage their entire team, from an independant TeamWave account with all the features. There is no need for you to manage their employees! TeamWave offers time logging as an out-of-the-box feature. You can log time spent on each task and compare that with the estimated time. Download the time log report with a few clicks (individual projects/all the projects) and upload it to any invoicing app. But, in case of Asana and Basecamp you need to depend on third-party integrations with apps such as Everhour and Hubstaff to achieve the same functionality. Both Basecamp and Asana are limited in terms of reporting. Asana gives you one type of project progress chart and Basecamp also follows the suite requiring multiple steps for visualizing and generating reports. For example, if you want to see the work load of a team member you’ll have to click on ‘Reports’, search the team member and click on ‘Run a new report’. Note that both of them don’t have holistic view of all the team members, projects and time logs. 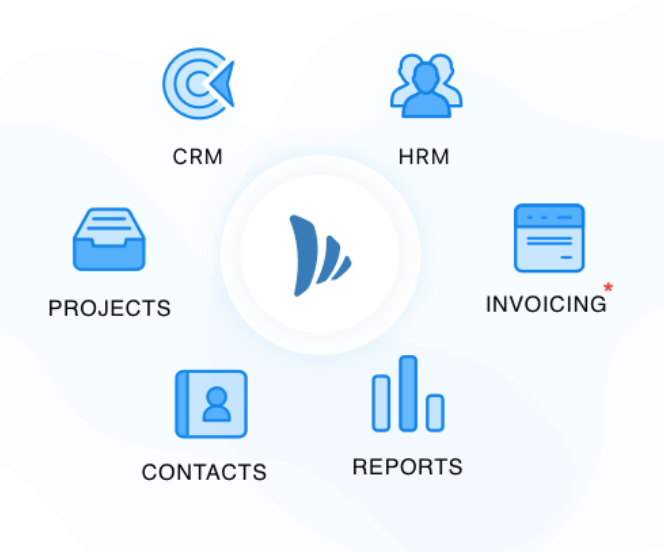 Both Asana and Basecamp offer sizeable number of integrations ranging from reporting and time tracking to file sharing and communication. However, the primary reason behind these integrations is the lack of comprehensive functionalities that an all-in-one app for small business should provide out-of-the-box. Project and HR: Project admin can keep track of the performance of the employees along with appreciation received from clients and log them as private notes in the HR app. During appraisal these notes can be reviewed for better decision making. Also, the well-documented API allows you to build seamless integration with your business process. While Basecamp has been generally known for its simplicity, Asana users traditionally experience steep learning curve. In fact, sometimes with the growth of the company users find Basecamp over simplified for a project management app. With TeamWave, the balance between usability and comprehensiveness of workflow/feature has been carefully crafted. It essentially provides the ease of use of Basecamp while delivering the power-packed features of Asana — the best of both worlds. Basecamp comes with one package ($99 per month) and a free trial for 30 days. Asana’s ’Premium’ package starts at $9.99 per user per month and offers unlimited dashboards, advanced search, custom fields, private team and project. They also have ‘Enterprise’ package which provides advanced admin controls, customized UI to match your branding and same day customer support. TeamWave has straightforward pricing – $3 per user per month (paid annually). Moreover all the plans get all the features and apps – absolutely no restriction. Coming to the crux of the topic, let’s see how pricing differs for a company of 20 people across the three apps. Both Asana and Basecamp provide support via email and ticketing system. In case of Asana, same day response is only available with enterprise tier. But, at TeamWave, we’re just a chat window away—everyone gets priority support. Send us a message whenever you’re in need of some clarification or facing difficulty. You can also log support ticket, browse our knowledge base and watch video tutorials. To sum up, TeamWave offers a unified platform of three essential apps (Projects, CRM and HR) required to run a small business with right balance of ease of use and robustness of features at much less price. Evaluate the options to the fullest potential before finalizing the app that will drive productivity and bottom line of your business.